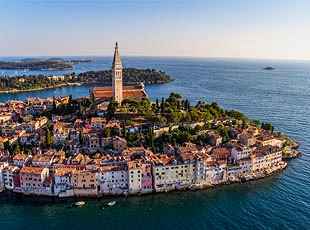 Istria, the biggest peninsula in Croatia, has been a popular seaside resort for wealthy elites since the 19th century. A Roman amphitheater, luxury 5-star hotels, magnificent countryside villas, nudist beaches and lush Mediterranean vegetation are all part of an unforgettable experience of visiting the Istrian coastline. Sail the peninsula and Kvarner islands with some useful guidelines from our Istra and Kvarner region sailing guide. If you're thinking about a yacht charter in Istria, Pula is the best starting place for your adventures. Pula's position at the southwestern part of this heart-shaped peninsula allows you to flexibly plan out your route, regardless of whether you have opted for a bareboat or skippered yacht charter. First of all, try to do the paperwork at the base as soon as possible and set sail as early as you can. Even though it is the first day of your sailing trip, doing the distance od 30 miles is worth the effort. The area you are about to sail is usually quite windy so you don’t have to be afraid of dull motoring. The first part of the trip leads you out of the deep bay of Pula. 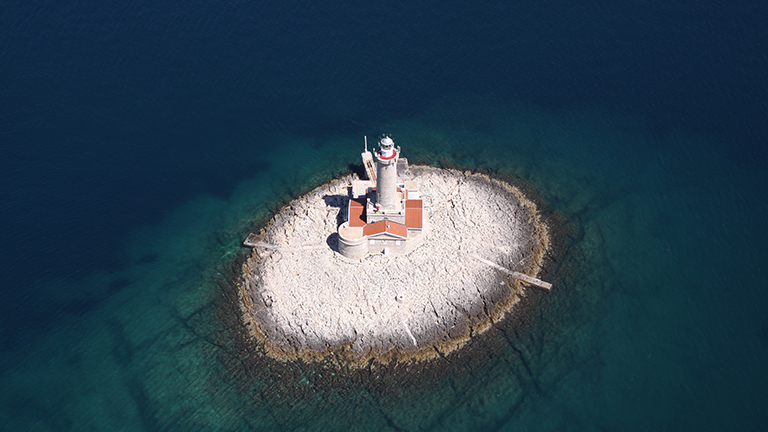 Then, you will head SSE to the cape of the Istrian Peninsula (Kamenjak) and sail around it. On your way you will pass the remote Porer Rock Lighthouse and some islets. Once you have left them behind your stern, steer to the E and trim your sails for passing the Kvarner Gulf on your way to the island of Unije. We recommend visiting one of the bays on the eastern side of the island. 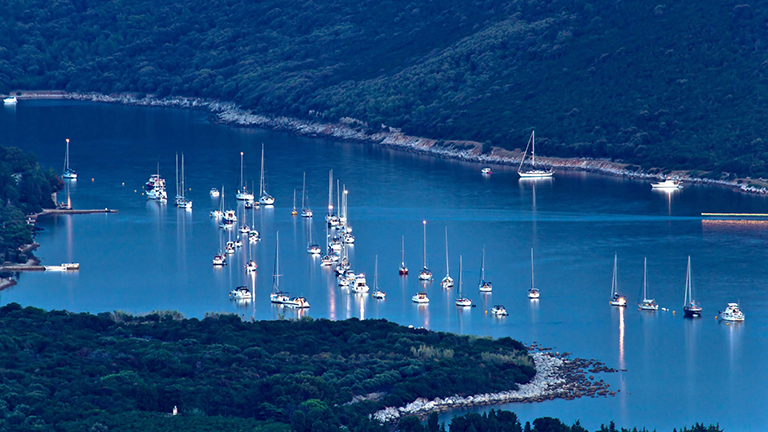 The most popular bay is the Maračol Bay where you can tie your boat to one of the 50 buoys to stay overnight. The concessioner has taken safety to a higher level, which means that the buoy holds four ropes – two thick white ones for each side of your boat and two thinner ones which hold the mooring lines for the stern. It is also possible to anchor on the west side of the island, in Unije Bay, just in front of the village. However, this side is more open to westerlies and northerlies. There is a road from Maračol to the Unije village which is good for a nice morning walk. We recommend asking the locals about a good place to eat. After taking a morning swim and/or a walk to the village of Unije, turn S and pass between the islands of Unije and Vele Srakane. Further sailing will bring you to a small but very interesting island of Susak. 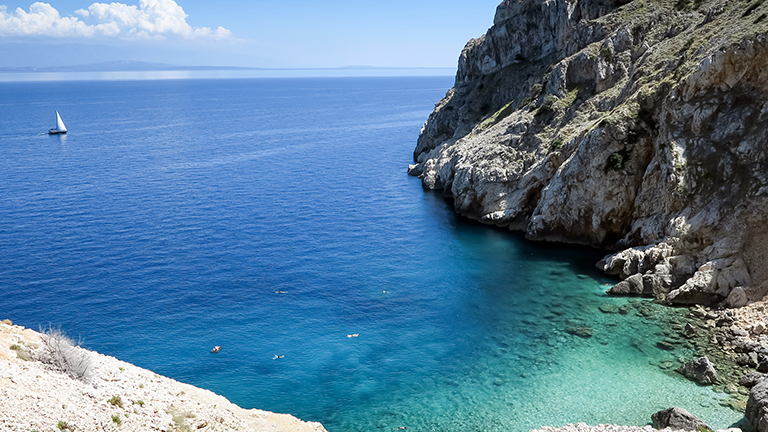 We suggest you take a break here – either for swimming, lunch or sightseeing. This small island is very specific for its sandy structure, and some people say that one centimetre of Susak Island is being washed by the sea every ten years. Susak is a tiny isolated island with a small port but has a very interesting cultural heritage, especially the national costumes, dances and songs. Take a walk to the village on top of the island where you can enjoy the view and visit an ancient graveyard. There are much more immigrants from Susak living in New Jersey than the inhabitants of the island. As they worked at the port and shipyards in New Jersey, they outnumbered the local workers, so other immigrants learned Susak dialect earlier than the English language. That happened some century and a half ago. Nowadays you can meet their descendants on their vacation on Susak. For the given reasons, American English is quite common on the island. After a break continue your trip by heading ENE towards Lošinj Island. Your destination is the town of Mali Lošinj. You should go around the islets of Murtar and Koludarc and continue sailing SE through the deep bay of Mali Lošinj. You will finish your day at Marina Mali Lošinj. This is a pleasant and very well organized marina where you can book the berth through the Internet or a smartphone app. The town is very vibrant in the evening so we recommend having a dinner at a local tavern, and taking a night walk on the waterfront. Today, you will again sail some 30 nautical miles. After exiting the bay of Mali Lošinj, go SE and follow the coastline of the Lošinj Island. After some 8 miles you will find yourself close to Ilovik Island. Take a swim break at anchor between Ilovik and the islet of Sveti Petar. It is a very well sheltered strait with plenty of buoys both for transit and overnight visitors. Next leg on your way to Rab takes you NE, where you should pass between Dolfin islets and the northernmost cape of Pag Island, the Lun Cape. 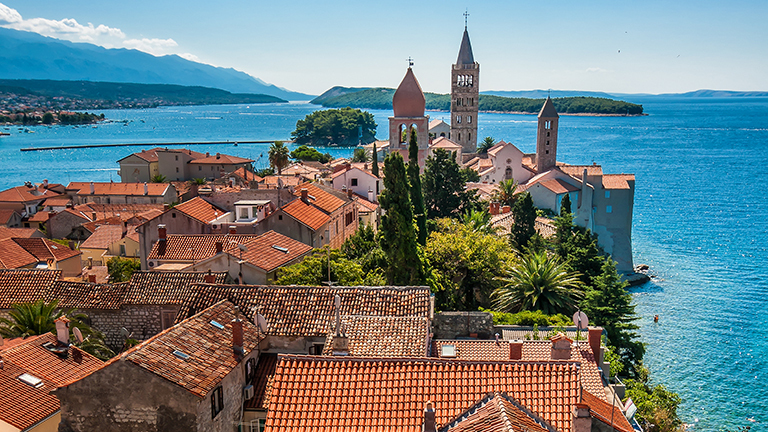 Continue sailing in the same direction and you will reach Rab Town on the island bearing the same name. 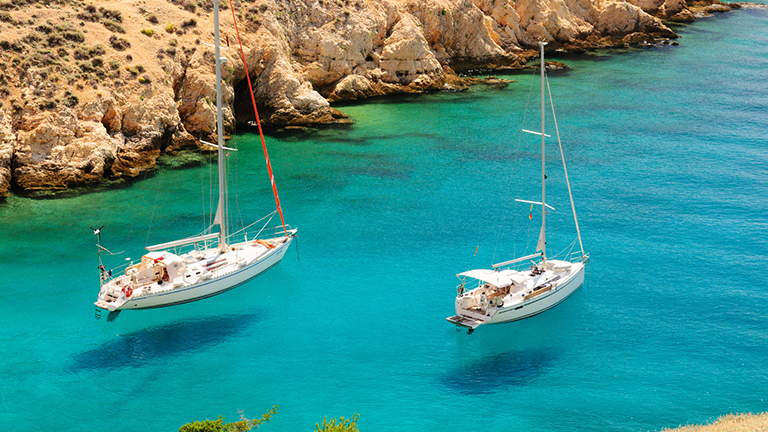 You can safely dock your yacht in ACI Marina Rab and explore the medieval town of Rab. The central event here is the Rapska fjera (the Festival of Rab) founded on July 21st 1364. Originally, the Festival was dedicated to St. Christopher for saving the city from destruction. Nowadays the Festival lasts almost the entire summer so all sorts of activities are to be expected in Rab. There are also plenty of nice places to eat there so it is very difficult to recommend only one. Taverns like “Konoba Rab”, “Šanpjer”, “Velum” and “Perla” are known for very delicious local cuisine, but the best option is to take a walk and follow your senses. 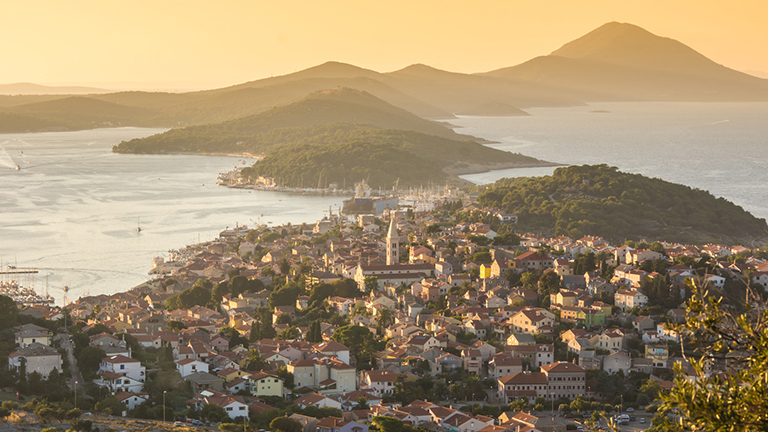 On the fourth day of your trip, you will sail around the N side of the island of Rab and head towards the island of Krk. Your final destination is Punat Town on Krk Island, some 22 NM away from Rab. You can take a swim break on your way to Punat at one of the coves in Kamporska Draga Bay or Supetarska Draga Bay, on the NW shore of Rab Island. However, when approaching Punat, one has to be very careful because of the shallows at the entrance to, and in the Punat bay (Puntarska draga). Besides anchoring you can stay overnight at Punat Marina, one of the most pleasant and best organized marinas in the area. There is also a shipyard within the marina, owned by Žic family. A must do here is a visit to the islet of Košljun and its ancient Franciscan Monastery. Besides telling interesting stories about the history of the area and the islet, cheerful friars will guide you through the museum and offer you homemade brandy at the end of the tour. Today, it is time to move closer to the base port, so head NW and N through the Srednja Vrata Channel. Beware of strong northerlies and round the N cape of Cres Island. Special traffic regulations apply to S and SE heading through Vela Vrata Channel because of the commercial vessels sailing to the Port of Rijeka. However, smaller crafts are also obliged to respect the rules, so take a closer look to the charts when sailing this channel. In the town of Cres on Cres Island, you can find your berth at the local marina. The town is quite popular among tourists but there are still some intimate places where you can have a meal. Cres’ lamb (spit-roasted or baked under the baking lid called peka) is well known local speciality but we also recommend trying thr seafood. Even though the end of your trip is approaching, save some energy for tomorrow. The final leg of your North Adriatic sailing trip is probably the longest, so cast off early enough to enjoy the last day of your vacation. Head to the W and round the Pernat Cape on Cres Island, after which your next waypoint will be Marlera Bay at the entrance to the Medulin Bay (Medulinski zaljev). If you calculate your ETA early enough to make it to Pula, you can make a swim break at one of the coves of Premantura Peninsula later today. Beware of the rocks and islets as well as the shallows in this area. If you don’t feel safe enough here, you can make a break in one of the bays S of Pula, in the nearby Veruda or in Soline Bay, for example. 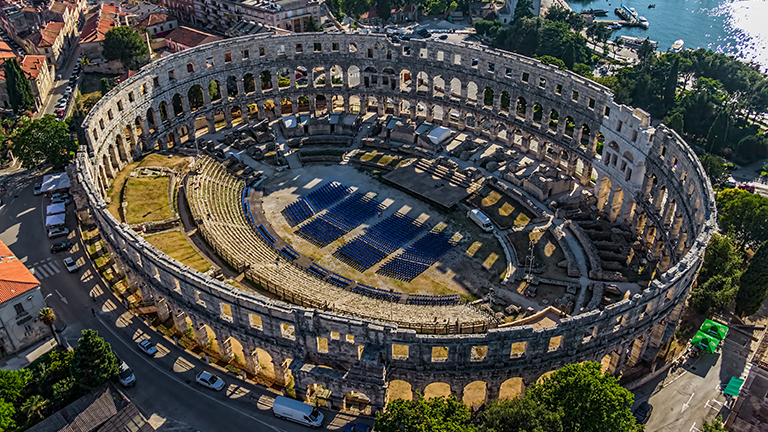 However, the final night should be spent in Pula Town, exploring its magnificent Colosseum and ancient Roman Forum. If you are lucky enough, you might find yourselves there on the night of one of the great concerts organized at the Colosseum. Supposing that you got your yacht ready relatively early since the Punat charter base is not a very busy marina, you can make some 20 nautical miles the first day of your sailing holiday. Beware of the shallows while leaving the bay of Punat (Puntarska draga) and head south. 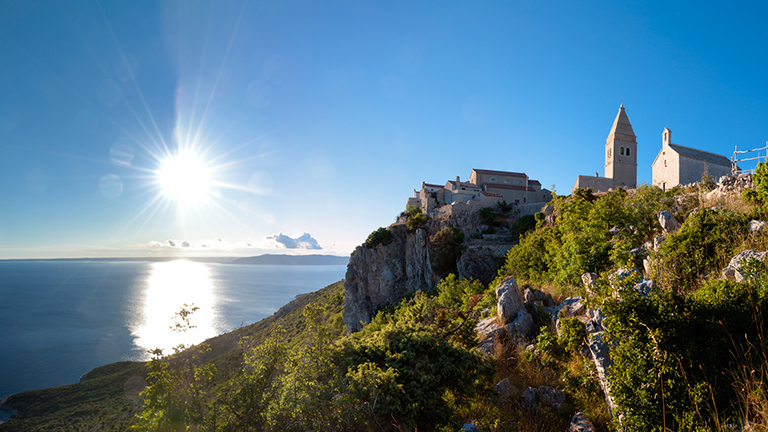 Set your bow towards Donja Punta Cape on Rab Island and steer eastward, following the coastline of the island. If you think you came too early to the destination, take some time to relax at anchor in one of the bays on the south side of Rab Island, on your way from Donja Punta Cape to Rab town. If you are not willing to spend the night in ACI Marina Rab, you can stay at anchor in Uvala Sv. Fumija Bay, which is in the vicinity of Rab Town. A slightly shorter distance is scheduled for the second day. The trip from Rab Town to the islet of Ilovik considers southward sailing between the islands of Pag and Cres/Lošinj. This area is called ‘the Kvarnerić’. Just below the south cape of the island of Lošinj lays a cluster of three small islands: Kozjac, Sveti Petar and Ilovik. The channel between Sveti Petar and Ilovik is a popular yachtsmen’s destination for its great protection from almost all winds and very well organized anchorage equipped with reliable buoys. Supposing that you are provisioned with enough water and full batteries, one night on the buoy, surrounded by beautiful nature and turquoise sea should not be a problem. This is a great place to enjoy swimming and snorkelling while making new friends. Late departure, lazy sailing and lots of swimming and snorkeling is what you are going to do on the third day of your sailing holiday. 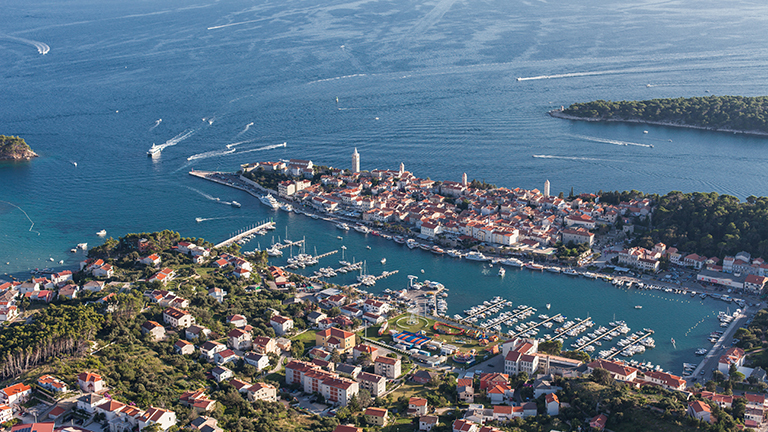 You are only 11 nautical miles away from the Marina Lošinj, which is your next destination. 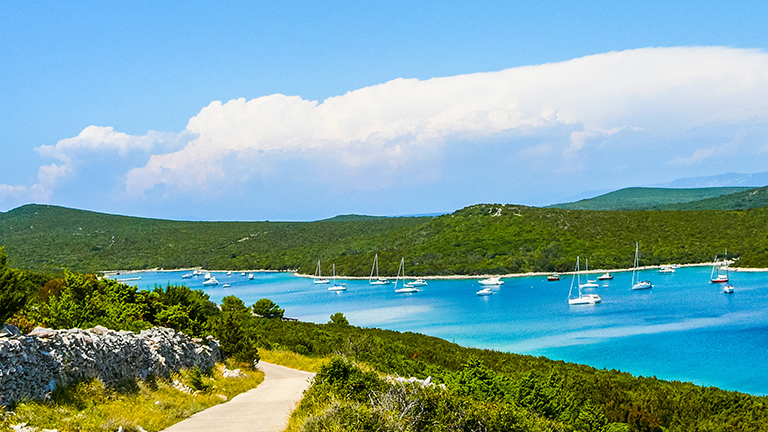 Explore the bays on your way to Mali Lošinj Town, such as the Sunny Cove (Sunčana uvala), Čikat Bay or Artatore Bay. 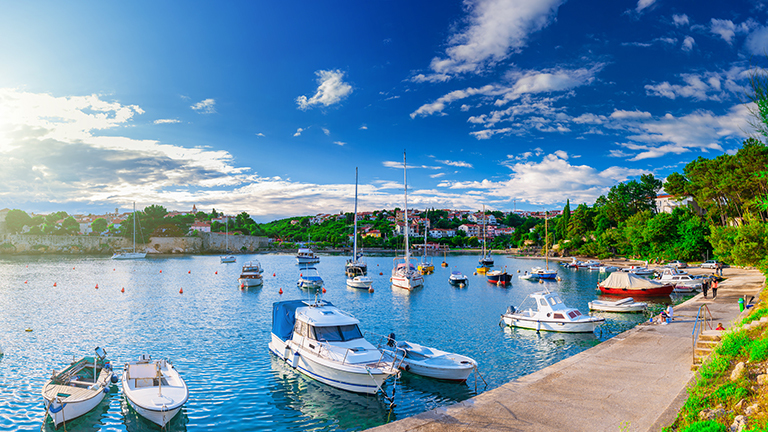 Marina Lošinj provides a safe berth, fresh water and electric currency while the town’s fish market abounds with fresh seafood. Don’t miss local taverns such as “Za kantuni” or “Bocca vera”. The first leg of today’s trip includes leaving the bay of Mali Lošinj and sailing SW to the island of Susak. Use your lunch break to walk around this isolated island and try the local wine which is one of a kind. Susak is literally made of sand which allegedly cures infertility, and many women left the island pregnant after trying for a long time. What is interesting is that many locals speak English and this is because many people from the island immigrated to USA, namely New Jersey. The final leg of today’s sailing leads you NW, between the islets of Vele Srakane and Ilovik, to the Maračol Bay on Ilovik. You will find well organized buoys there, and if you want to do the groceries and stretch your legs at the same time, take a walk to the village on the opposite side of the bay. To reach Cres town from Unije, one has to head north, between Cres Island and mainland, leaving the islet of Zeča to starboard. Beware of the strong gusts and currents in the channel, as well as large ships heading to the port of Rijeka. Calculate your ETA (estimated time of arrival) to Marina Cres early enough to find a tavern that serves local lamb. Cres’ lamb, prepared under the baking lid called peka is a local delicacy as well as seafood. There is a lot of sailing to do on the final day. The first leg after leaving marina Cres leads you NW straight through the Vela Vrata. Take a close look at the chart because there is a special vessel traffic regulation in Vela vrata. Once you leave Vela Vrata astern, round the N capes of the island and continue sailing eastward and SE to the island of Krk. 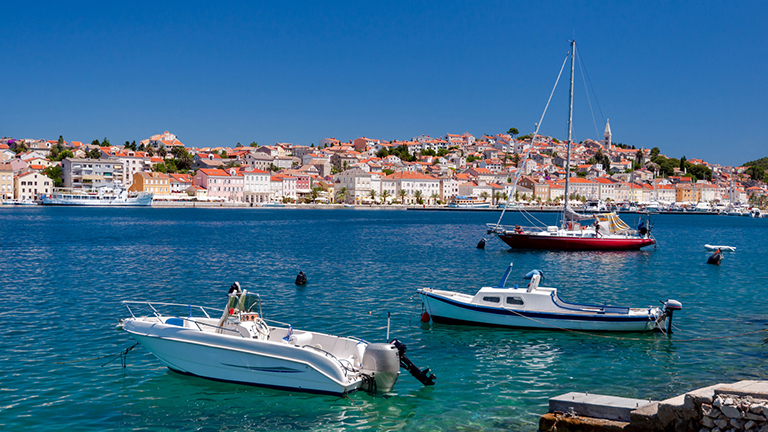 Even though Krk Town is worth visiting, it is more appropriate to continue sailing towards Punat. It is a much better idea to make it through the Bay of Punat in the daylight due to its shallows. You can visit Krk Town by car after leaving the charter base in Punat. Interested in Sailing Holiday in Istria Region?